"They're hauling oil to the well instead of away from it!" The song Mexicali Rose, introduced in 1937, was one of Gene Atry's bigger hits. As such, it was a natural to form the loose basis for one of Autry's many pictures. There's no Rose to be found here, though, even if it does take place in Mexico near California. Gene is a radio star sponsored by the Alta Vista Oil Co., but he becomes suspicious of the company's integrity after Anita Laredo (Luana Walters), head of the local orphanage, displays impatience at Alta Vista's failure to pay any return on investment. Sure enough, evil CEO Carruthers (William Royle) has been defrauding the locals, using Gene as a shill. But how is Gene to prove it? With the help of sidekick Frog Millhouse (Smiley Burnette), of course, with more than a few songs. While Gene and Smiley are in their usual fine form, the picture is well and truly stolen by character actor Noah Beery as Mexican outlaw Pedro Valdez. Although the portrayal is pretty broad almost to the point of being offensive, it's hard to resist his likeable joviality as he takes to the example of Robin Hood with a vengeance. He also gets in a few scary moments early on, stealing Champion out from under Gene's nose. Another former silent star, William Farnum, makes an appearance as the kindly Padre Dominic who helps out at the orphanage. Luana Walters has a nice fire to her character but she really doesn't get much to do here. In 1930s radio it wasn't unusual for stars to crack wise about the sponsors, but this film takes things a bit farther by making the radio sponsors out to be genuine thieves. It's kind of an eyebrow-raising scenario, though it should be noted that Autry didn't yet have his Melody Ranch radio show, so he had a little more latitude in 1939 when this picture was made. But considering gas prices lately, even modern audiences can get behind a picture that vilifies oil companies. Image Transfer Review: The original full frame picture looks pretty good for its age. It's somewhat soft, with some persistent flicker and modest speckling. Grain tends to be fairly heavy and somewhat on the sparkly side. But the elements are in reasonably good shape, with very good greyscale throughout. The restoration is by UCLA. Audio Transfer Review: The 2.0 mono audio suffers from a fair amount of noise. The optical track has plenty of hiss and other obtrusions that detract from the experience. The songs are fairly decent sounding, though they lack range and depth. 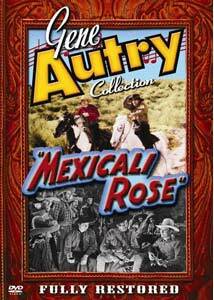 Extras Review: Although most of the usual assortment of extras from the Gene Autry Collection are present, there's not quite as much here as usual. The Melody Ranch Theatre intro from 1987 with Gene and Pat Buttram is particularly rambling, with very little about the film itself. Instead the conversation turns to such diverse meanderings as yucca plants, the origins of Here Comes Santa Claus and the performance of the California Angels. As noted above, there wasn't yet a Melody Ranch radio show when this film was released, but an episode from about a year later, April 21, 1940, is included here, featuring Gene as a cattle inspector trying to enforce a blackleg quarantine. A nearly complete set of about 60 stills is here, as are over 20 lobby cards and posters. A section on Production Reports not only include such material, but several pages from the original script, the Production Code approvals and the documents for loaning Walters from Paramount for the film. There are also presskit materials and production notes. It's still quite a lot of material, even if it's not quite as copious as one gets used to with this series. A bio of Walters or Beery would have been nice, for instance. A fun entry in the Autry canon, with a great supporting performance by Noah Beery and a nice selection of Autry songs.